It was finally a week where the dorado decided to join the party and just-in-time for Chad Schearer's TV show "Shoot Straight" and his family to show up with the cameras. http://www.shootstraightTV.com Chad is the TV host of the program and usually travels the world with either a bow or muzzle-load rifle, but is quite a celebrity with the flyrod as well. He filmed all week with us and one of his sponsors is Cabela's Outdoor Stores. They wanted him to test out their new 6-piece travel flyrod that looked so thin and light a trout would've broken the 10 wt stick! Chad's intent was to get a big roosterfish on it, but when a big dorado charged through, it was GAME ON! Chad battled this monster 40-pound rooster on the light flygear for 1 hour and 45 minutes! 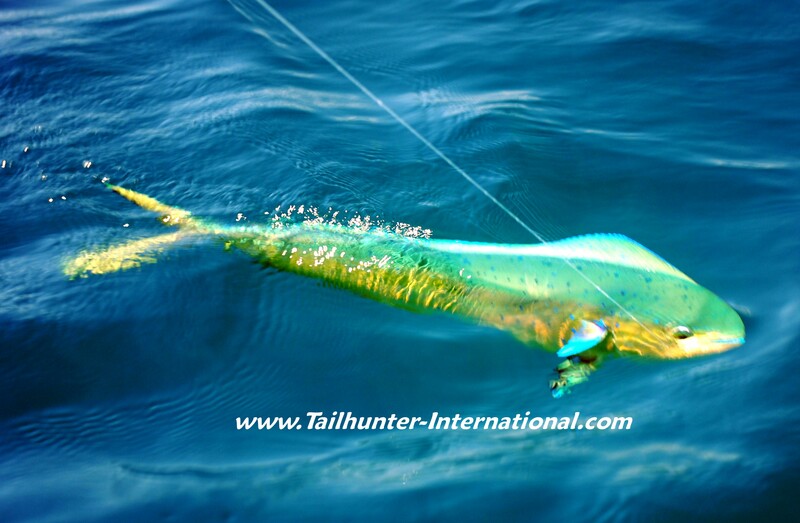 He had never gotten a dorado before and this was a personal best...and all in front of the cameras! Wahoooo! We finally got one to the boat. For weeks, I've been saying the conditions are right and Roger Thompson finally nailed one on a rapala at the north end of Cerralvo Island. He said te day was going slow (note the tuna boat in the back!) but he usually comes through and this 60 pound class speedster topped the day! 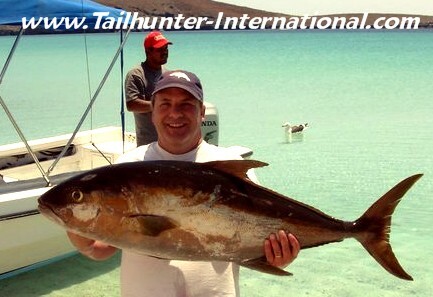 It was a stellar week for roosters for both our La Paz and Las Arenas fleets with fish up to 80 pounds. Sheldon "Doc" Schearer is a minister and sherrif's officer from Montana and this 60 pound rooster was a personal best. It ate a live sardine in about 10 feet of water near the Las Arenas lighthouse and took 1/2 an hour to battle. The fish was released. In fact, they caught 6 that day and all but one fish were put back in the water. 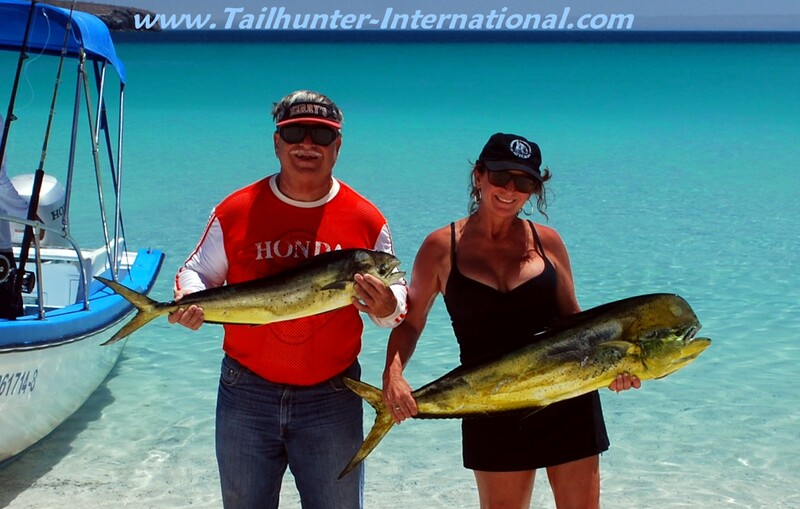 Tailhunter's own Jilly Roldan got into the nice dorado bite late this week posing with San Diego's Joe Jacobs in the blue waters of Balandra Bay north of La Paz. They also got roosterfish and small yellowtail, but ran into a spot of dorado that blew up on them and they lost count of the fish with double and triple hookups! Tihs is the first week that dorado bit consistently. Not surprisingly, the waters edged over 80 degrees too and the winds calmed down. hmmmm...funny how that works! 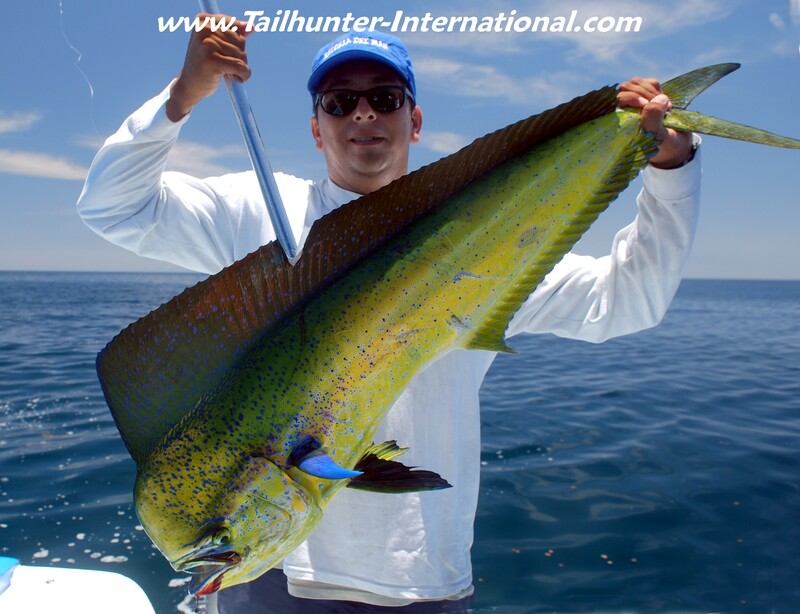 But the week started slowly, but by mid-week the counts were going up with mostly smaller fish in the 5-10 pound category, but as the week went on, there were more 20-40 pound fish in the counts and hardly anything prettier than a lit up mahi on the hook like this one taken off Espiritu Santo Island this week. 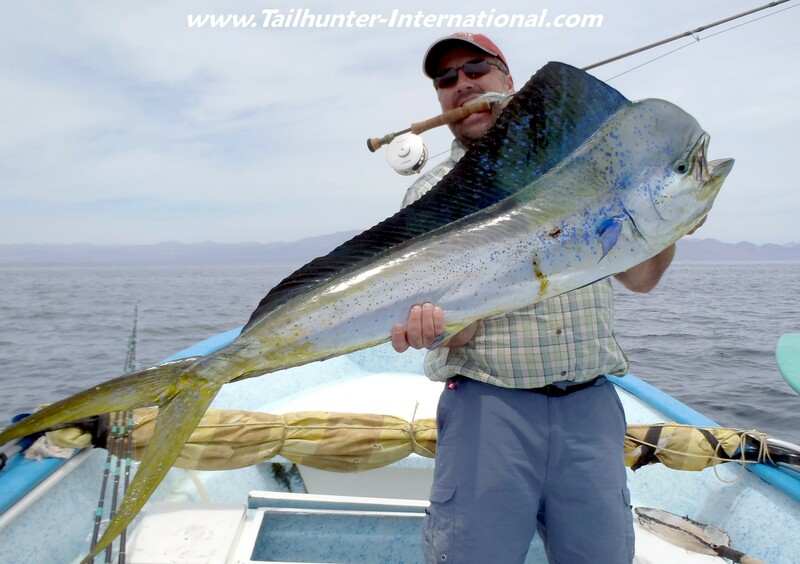 Even last season we didn't see many bull dorado over 20 pounds, but this week we had some fish in the 30, 40 and one that may well have been over 50 pounds! 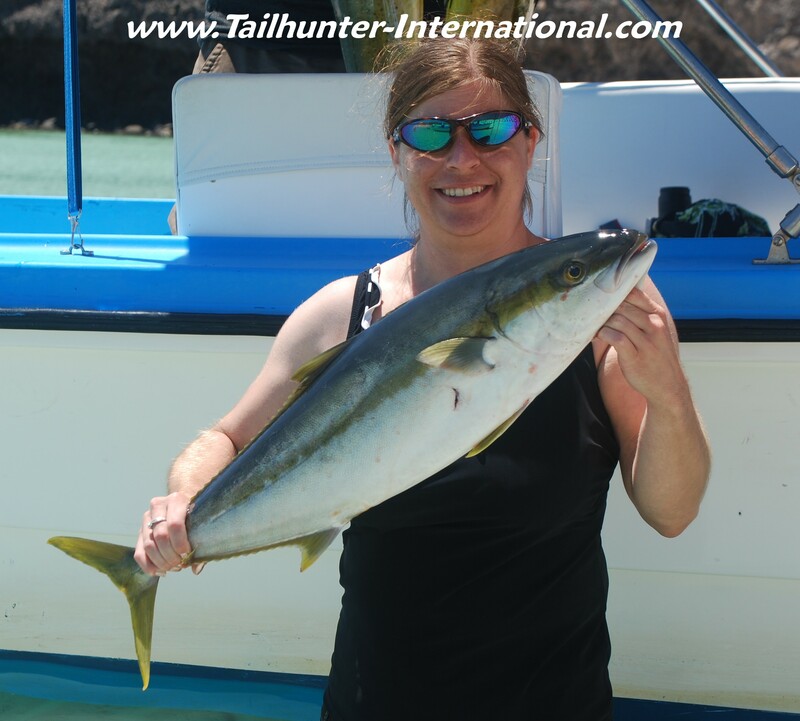 Jill got this one on the NE corner of Espiritu Santo Island just off the drop-off on live bait. Captain Joel holds it up for the photo! The waters are holding various spots of fish but they're scattered in all the usual places with many holding under building schools of sargasso weeds floating on the surface! Even tho' waters kicked into "summer mode," there were still some "cooler water" fish around like this decent yellowtail held by Lisa Chandler of La Mesa CA. We actually took a few of these YT's this week. Even when the fish weren't biting it seemed there were often schools of dolphin blasting through...wherever dolphin go! It was not unusual to see half the fleet suddenly stop what they were doing to follow the schools! This one was between Cerralvo and Espiritu Santo Island. 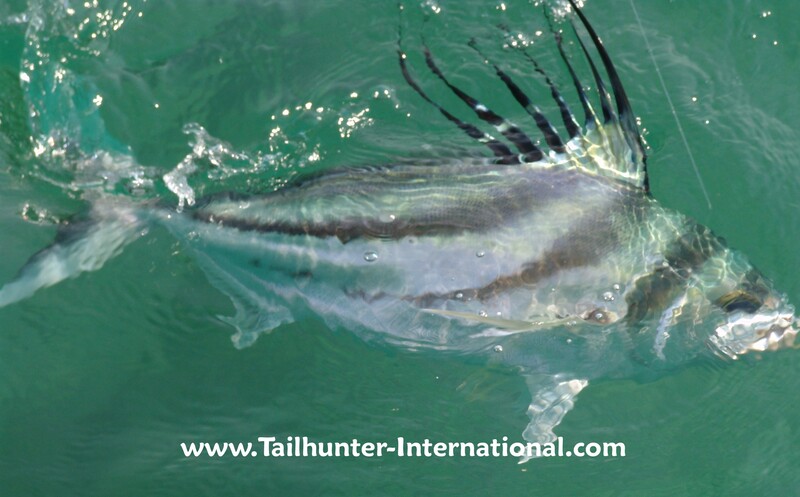 For alot of our clients and friends this week, it was their first time tangling with roosterfish and underlines why La Paz waters are called the "roosterfish capital of the world." Joe Jacobs from San Diego took this nice one in Pilot's Cove north of La Paz and released it. 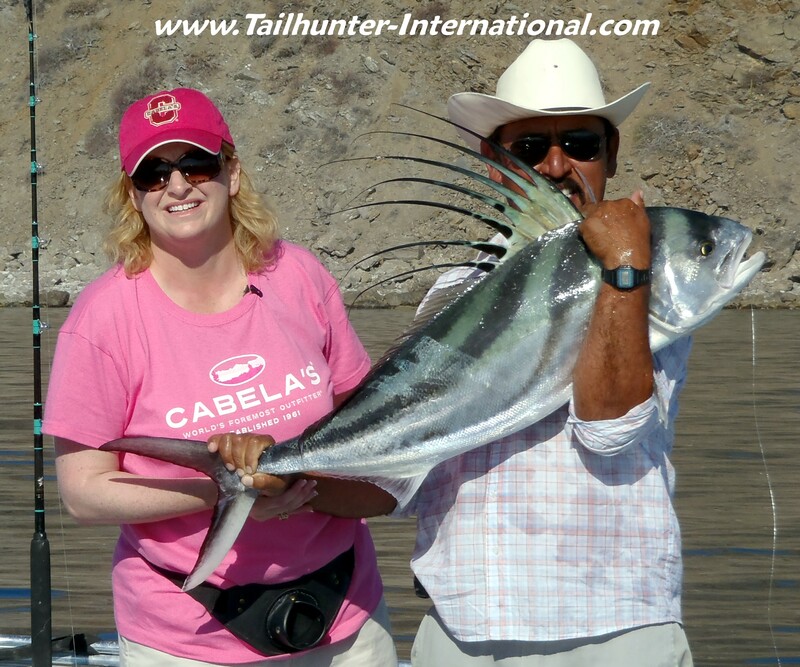 The roosters were biting for BOTH our Tailhunter La Paz and Tailhunter Las Arenas fleets. Captain Jorge with our Las Arenas fleet helps Marsha Schearer pose with this slug rooster caught in shallow water just outside Bahia de Los Muertos. SLOW START TO WEEK CRANKS UP WITH DORADO AND ROOSTERFISH! best. I was pretty worried. But…the conditions changed! their knees on the smaller gear. This is a "pig" of a yellowfin tuna! Scott Shiminesky from Pacific City in Oregon was up at the north end of Cerralvo Island with Captain Pancho. They had already run out've live bait and decided to drop back a big mackerel-pattern Bomber lure. They had just gotten it into the water when the freight train hit. "I almost burned the hell outta my thumb!" But after a 30 minute fight got the fish to the boat and it weighed out at 72-pounds. His amigo, Larry Parnell got a 30 pounder as well. The tuna continue to tease. Everyone gets excited then the fish disappear! But, still a great fish! FRESH ONE! Are there many shots prettier than this? Tuna...game over! Forty pounder coming to the gaff. At the end of the week a flurry of nice-sized YFT's showed up on the radar! Roger Thompson is an excellent fisherman and if there's fish to be found, he's usually in the thick of it. Like I write below, the winds died and the fish came to play like this 42-pound yellowfin tuna. (See Roger's account below). I had to post up this photo because Roger is usually incredibly photogenic with his fish, but here he's in pain lifting up this fat fish! The benefits of having TWO fleets! After two slow days at Las Arenas, we suggested that Kevin Blakely and his son Kevin and brother, Kim, (not shown) fish with our La Paz fleet and Captain Chito. Wow...what a difference a day makes! See his comments below. The last few weeks have been some of the most consistently great weeks for BIG cabrilla that I have seen in awhile especially around Espiritu Santo Island. 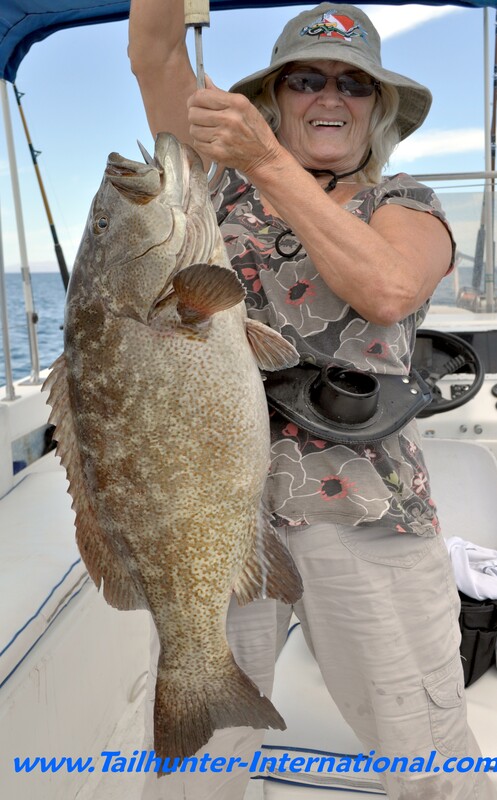 Look at this fat slug cabrilla that Donna Thompson is holding up! She was fishing with Capt. Chito. First time visitor to La Paz, Bryan Graybill, got into the cabrilla bite with four of these trophy cabrilla landed. All the way from Billings, Montana for his first rooster, Jess Landers escaped the snow and fished with Captain Juan and got this nice rooster. Roosterfishing has actually been a good fallback even when the other fishing has been off. Even if not good eating and most getting released, they're a blast to hook and fight! Our buddy Rick Hosmer from S. California had another banner trip down here. 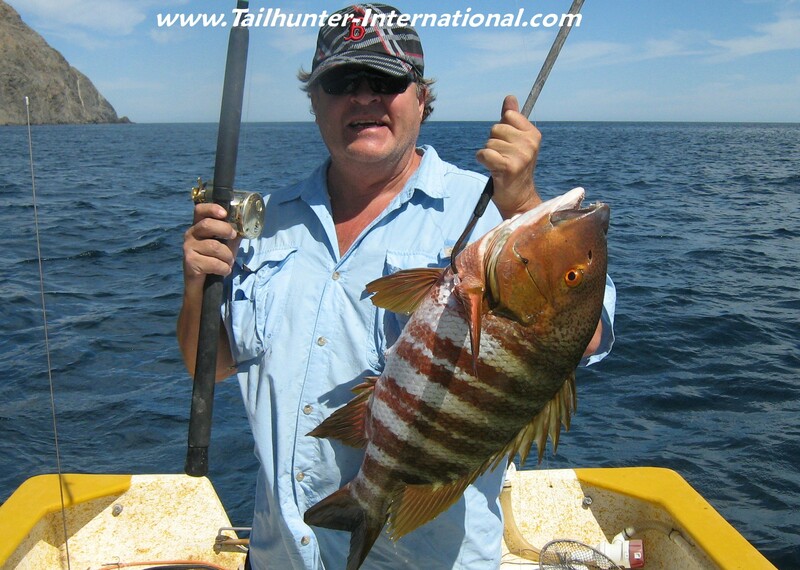 He comes several times a year and had one day where they had non-stop action on these great eating barred pargo that are tough as any fish to horse outta the rocks near Las Arenas. From Texas, Kevin Blakely holds up one of several yellowtail off the north end of Cerralvo Island north of La Paz. Captain Chito is hooked up at the stern. That's the sealion colony in the background. Another of our regular die-hard good amigos who comes several times a year is Al Tesoro. He hung in there durring the tougher times this week but did get some pargo like this nice dog-tooth with Captain Yofo. WEEK STARTS AND ENDS STRONG BUT SEVERAL DAYS MID-WEEK STRUGGLED! It’s hard to describe the week. Started strong…then mid-week, it hit a bump….but then finished on a high note! The week started strong for fishing then as the full moon came up and the winds increased…well…it got pretty stinky as far as fishing is concerned. That one-two punch of high winds and the full moon has really been a kick-in-the-pants the last two times it happened. Normally, any one thing isn’t bad, but double-barrels doesn’t help. The wind especially turns the water over not to mention making it hard to find bait which is kind of a good thing to have. When things were working…everything worked. Trolled feathers. Live bait. Dead bait. Rapalas. Yo-yo iron. All clicked! Oh…and we had small squid floating on the surface as well creating some real foamers when the fish went off. But then the winds came back up. Fishing went back down! Just when we thought we were finally done with the winds, we got spanked. …late in the week, both our La Paz and Las Arenas fleets really had to scratch out some fish. Some yellowtail, some pargo, a few cabrilla and lots of bonito. That was almost it. Three days of frustration and bumpy rides! However, as I’m writing this at the end of the week…THE WINDS CALMED DOWN. Gorgeous weather came back. Seas laid down! Today, we got our first decent dorado bite of the season with our Las Arenas fleet. Nothing big, but fish to 10 pounds came swarming to the boats with double and triple hookups! Plus some big roosters in the 30-50 pound class. 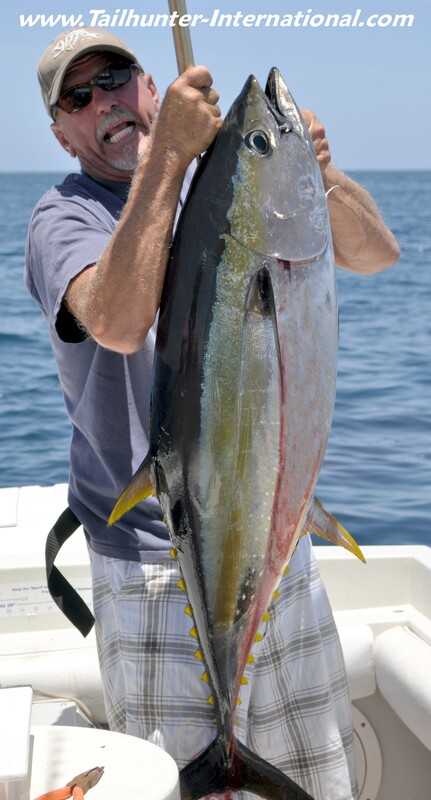 Additionally, take a look at some of the tuna we got…30-40 pound YFT’s! Four our La Paz fleet…again, what a difference when the wind isn’t blowing! We got dorado, marlin, roosterfish, yellowtail and amberjack! A complete 180 degree turnaround. It’s all about the wind. Hope the winds hold off and the fish stay ready to chew! “We had a great trip. so we decided to go to the LaPaz side. Thank you for making that happen, as you can see we slammed it. 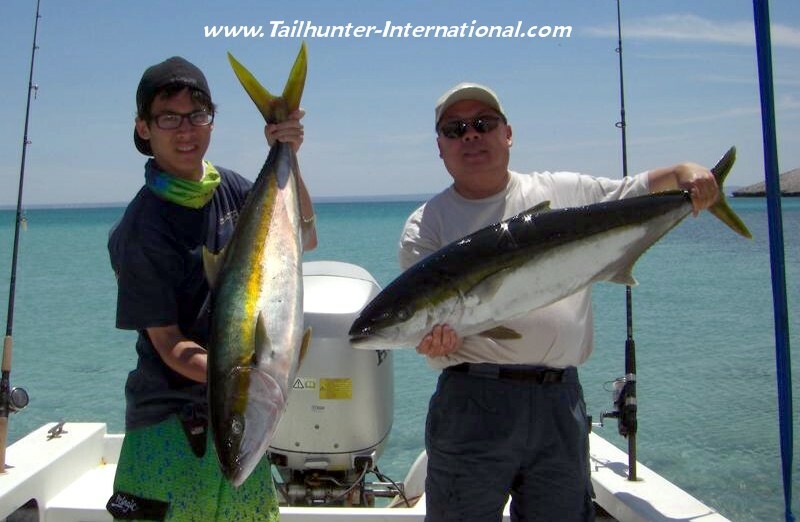 I caught 2 massive Yellowtail – a 35lb and 25 lb. My brother Kim, caught a 30lb Yellowtail. This was a week when the ladies sure shone! Donna Thompson didn't catch ALL these fish, but she sure put some numbers in the box fishing with her husband out've La Paz. Look closely and you'll see yellowtail, amberjack, cabrilla and others...pretty much the whole gamut of species that bit this week. Another good day where the ladies rocked! Sylvia Lynn was fishing for her first time ever. 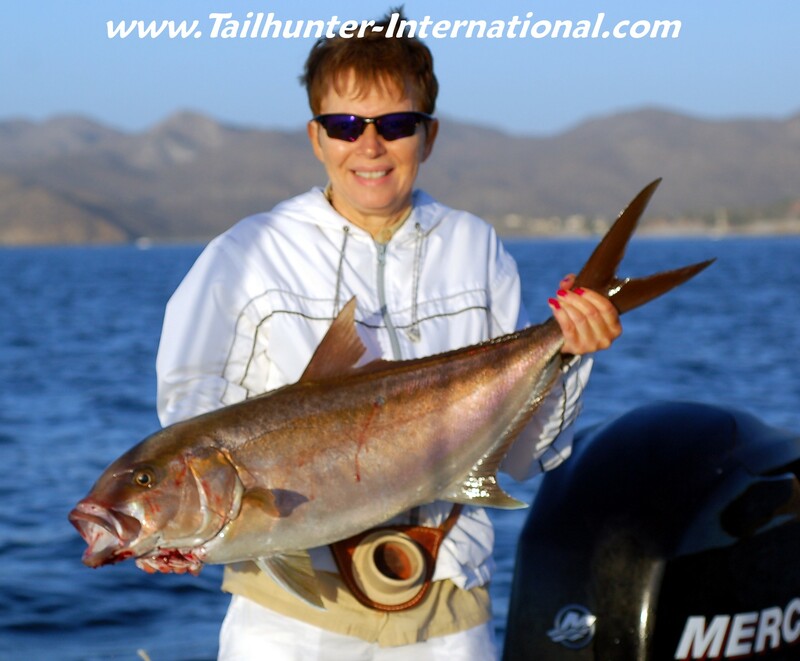 She and husband, Jeff, visited La Paz for the first time for their 27th Anniversary and she caught the "biggest and most" of the fish including yellowtail, ambjerjack and snapper although Jeff did get his biggest amberjack (see below). 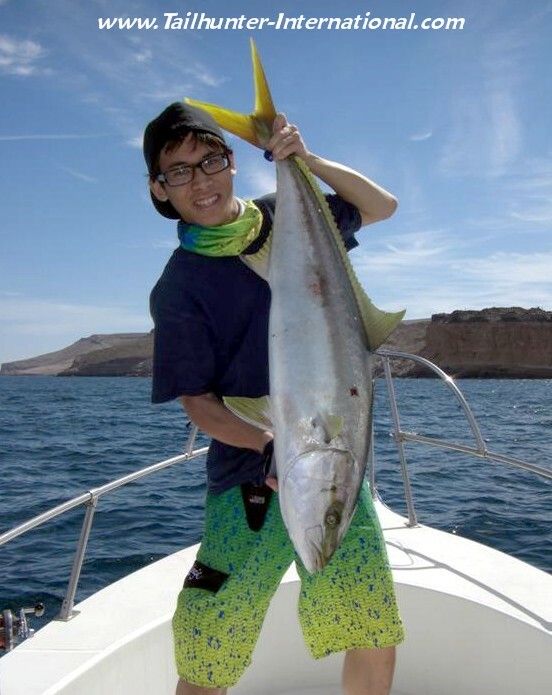 Probably one of the most colorful photos of the week given Mike Lee's shorts and the nice yellowtail he caught north of La Paz. 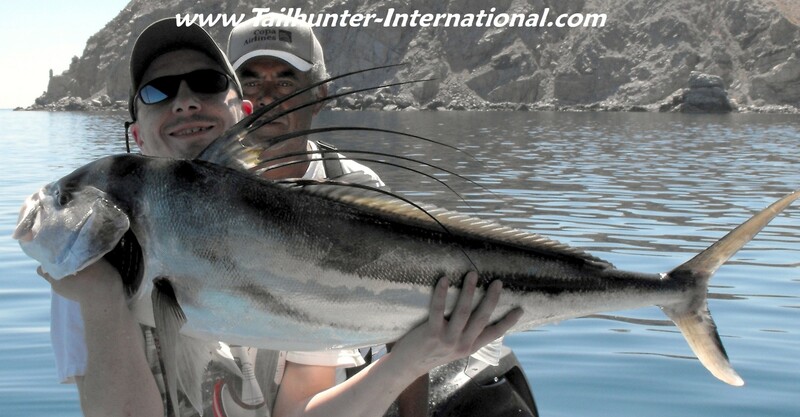 Mike and his dad fished both our Las Arenas and La Paz fleets and in the back is pictured Espiritu Santo Island. He only had one day to fish, but made the most of it. Jeff Lynn shows off a personal best amberjack he caught working "yo yo" iron "until my arms fell off" getting yellowtail and snapper as well. 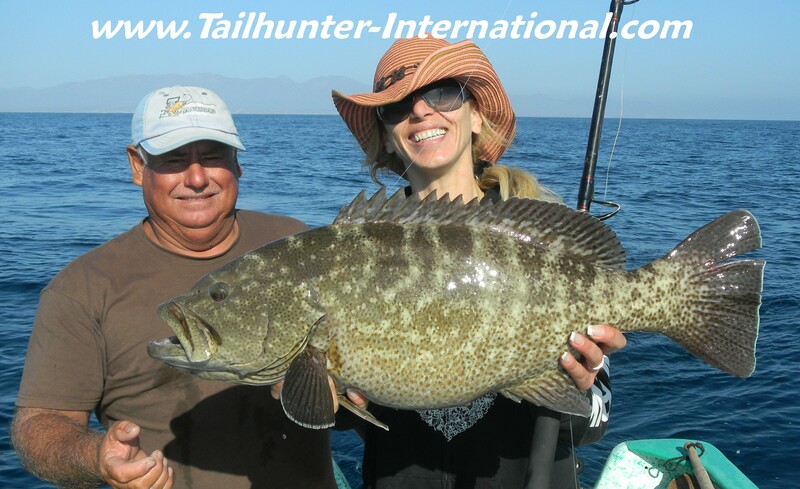 La Paz fishing was definitely better than Las Arenas fishing, but Las Arenas definitely had some highlights especially for fishing barred pargo if you check out the catch by Rick Hosmer, Captain Mundo and Jorger Romero (who took the photo). It was a dynamite week for these big cousins to yellowtail. 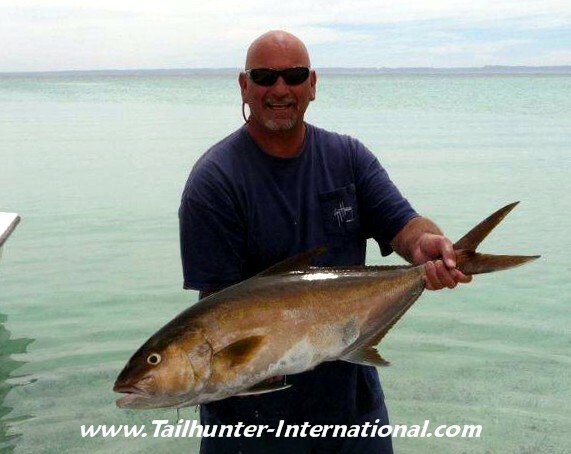 Amberjack were big hightlights of this week up to 80 pounds. Roger Thompson stuck this big boy north of La Paz. Dr. Desmond Sjauwfoekloy always does well. In addition to some nice yellowtail this week he also took home some nice slabs of barred pargo. Fishing iron was the ticket. "Cranked as fast as you can!" 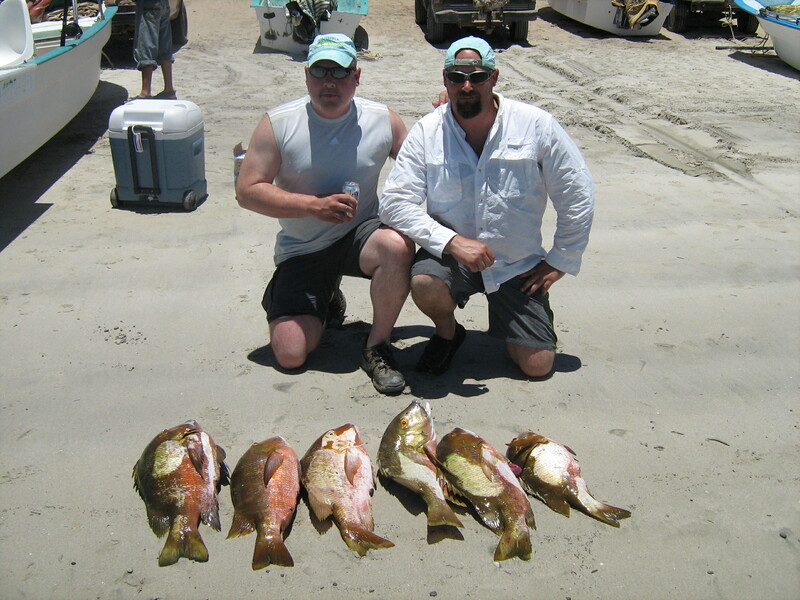 Oregonians Scott Shimenesky and Jason Boykin pose on the beach Bahia de Los Muertos with a nice day of barred pargo. Tony and sons, Mike Lee spent 3 days fishing with us this past week and got several great varieties of fishing but really did nicely on the yellowtail. Both are from Valencia. This was week was another wacky week and another week that I appreciated that we have two full-time fleets working. For whatever reason…dirty water…too much bait in the water…bad luck…bad current…our LasArenas fishing continues to be scratchy at best. There’s some good action to be had, no doubt. If you fished this past week with my Las Arenas fleet, you got into cabrilla, some decent pargo, roosterfish, lots of bonito, jack crevalle and snapper. Good action, and fun, but just not alot to get excited about to be honest. That’s the way fishing is. By the time you are reading this, it might have changed and gone off the charts! Sort of “minor league” fishing. Get bent. Get a little sun. Catch a few fish for dinner. Normally, this time of year, the better fishing is with our Las Arenas fleet, but not so for the past two or three weeks. If you wanted QUALITY..that’s why I’m glad we have both fleets. 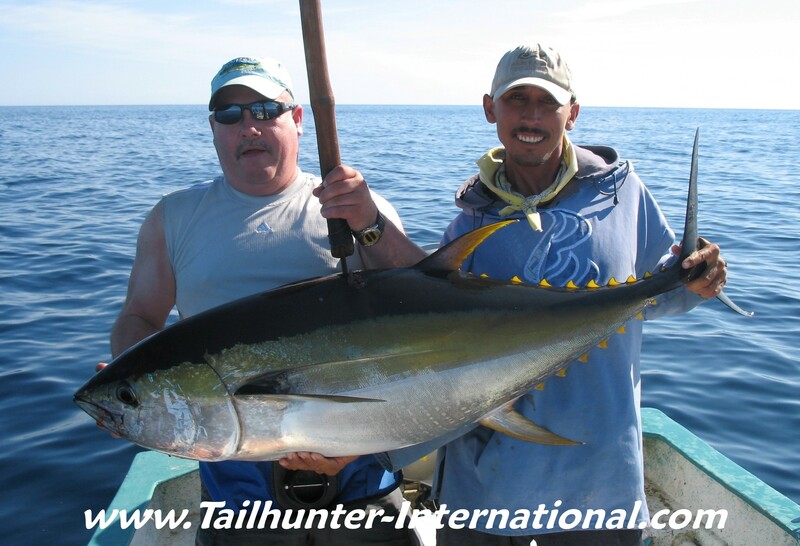 We were able to switch many of our clients over to fish with our La Paz fleet. And that’s where you fished if you wanted to put some fat fish in the boat and fat fish in your ice chest. 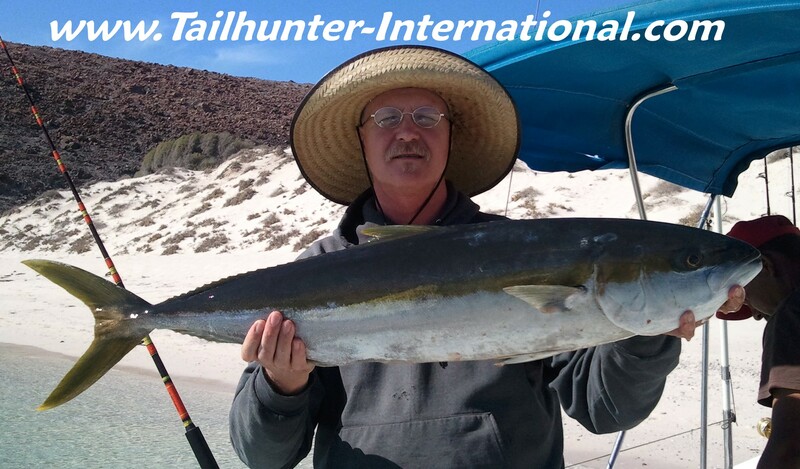 In an unusual late-season bite 20-40 pound yellowtail again got active with fish eating sardines, larger baits like caballitos and yo-yo iron in scrambled egg and blue/white patterns. (“You just gotta wind that reel handle as fast as you can! 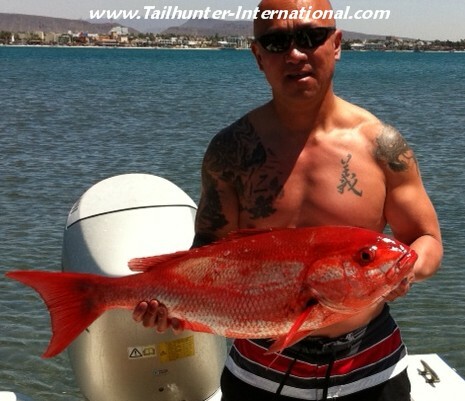 If you slow down or your arm ain’t hurting you won’t get bit!” said one of our anglers. ) Also, there were alot of spots of smaller 12-inch squid floating on which the yellowtail were foaming and crashing so we were netting the squid for additional bait. Sending one down with a sliding egg-sinker would almost guarantee a bite. 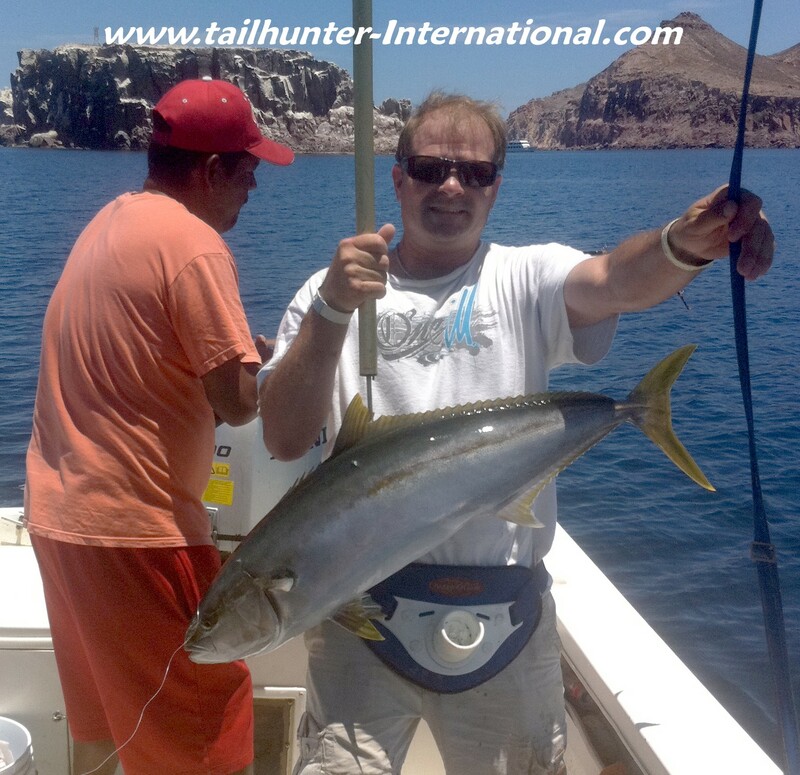 For many of our anglers this week they got their first or largest yellowtail ever. Some of our captains told us of larger fish up to 50 pounds breaking off as these are really horses when hooked! 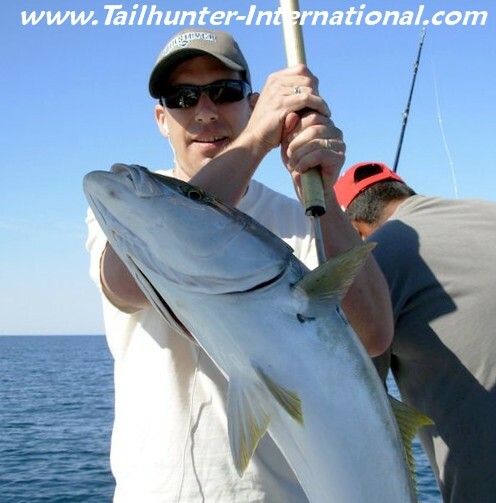 As well, we continued to get some big amberjack, pargo and cabrilla as well. 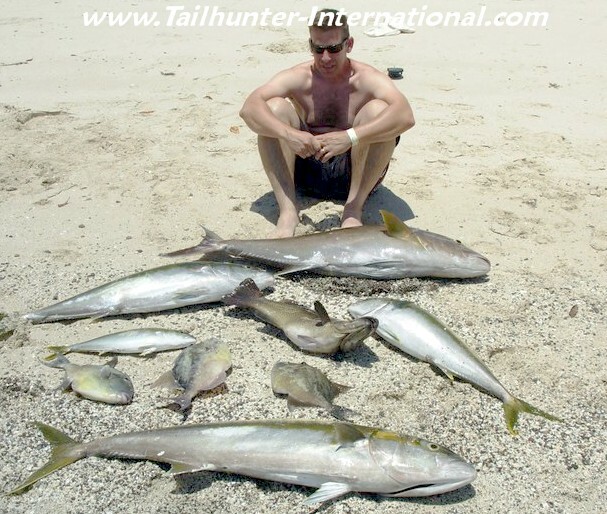 Some of the amberjack this week…no kidding…40, 50, 80 and 100 pound beasts! Some of the slabs of fillets were like hamhocks! Plus, we lots some fish that were larger. This could all switch around really fast again, but again, that’s why we have the two fleets going full -time to make these adjustments as needed! We’ve got more sargasso weeds building all the time so if temperatures keep warming I would be surprised if we didn’t start seeing some dorado real soon! 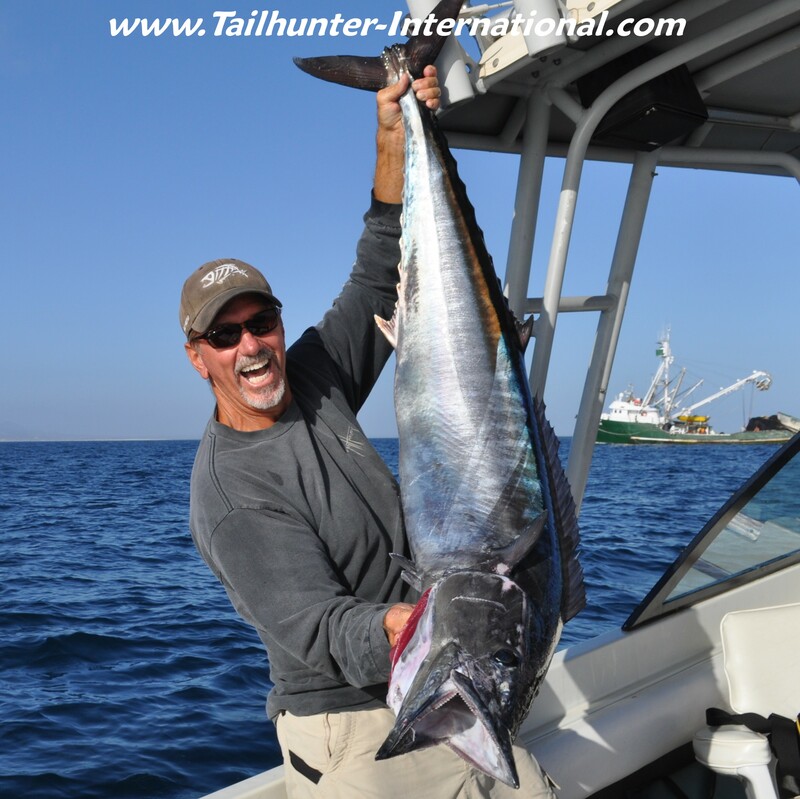 FLASH – Just as I went to post this up, we have reports of several big 50-70 pound tuna caught by our Las Arenas fishing fleet! Will keep you posted! Oh-oh! Now what? After a slow week of fishing, the bite north of La Paz fired up and anglers like first-timer Erik Rose from Arcadia CA had the dilemma of wondering what to do with all the fillets they had to bring home. 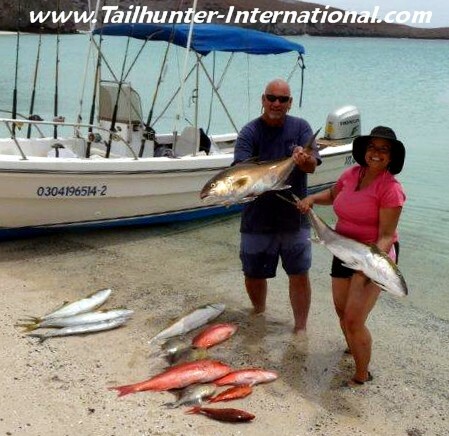 Seen on the beach are yellowtail, triggerfish, amberjack, cabrilla and snapper.Unbridled joy outta Keith Brownfield who came down from Washington just to catch a roosterfish and, although it was rough early in the week, he got a 30 pounder his first day. 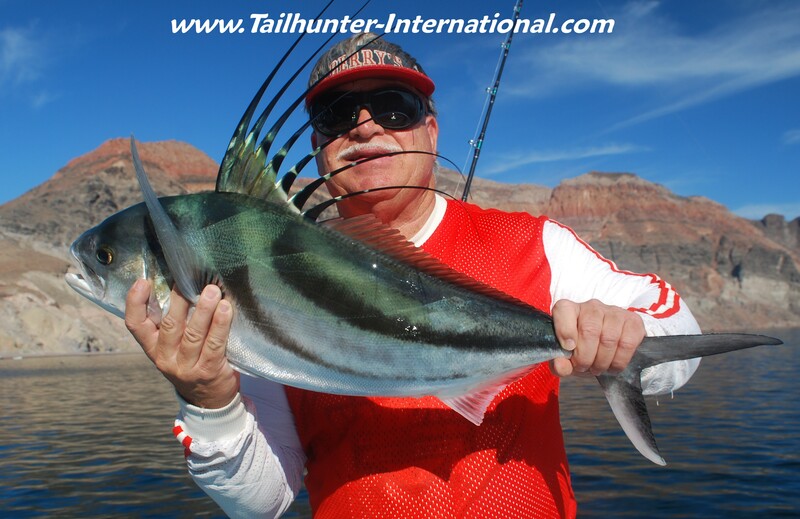 He followed it up the next day with this 40 pound fish taken near Espiritu Santo Island. He couldn't have been happier! All the roosters were released. 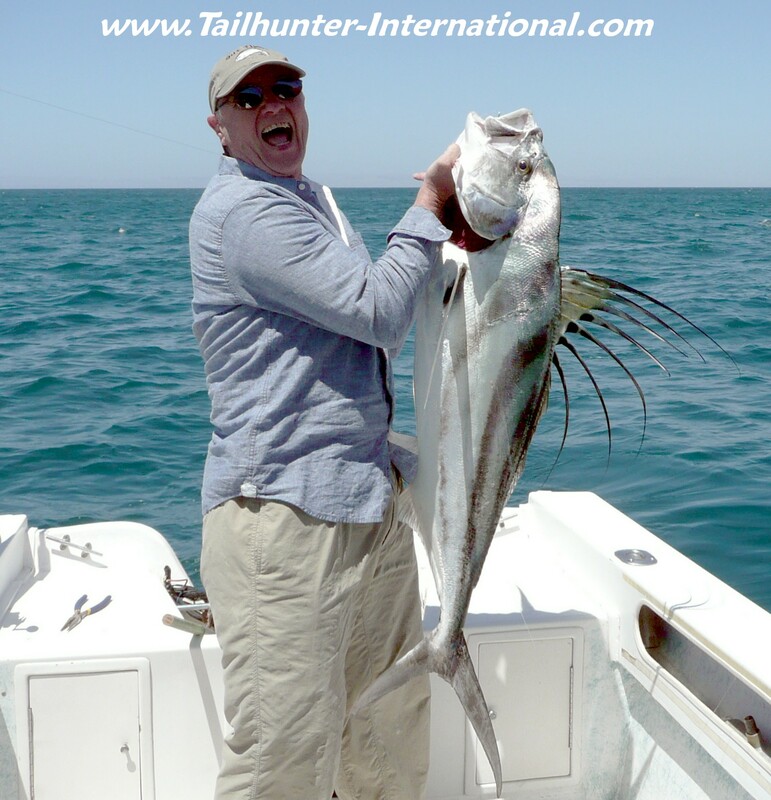 Unbridled joy outta Keith Brownfield who came down from Washington just to catch a roosterfish and, although it was rough early in the week, he got a 30 pounder his first day. 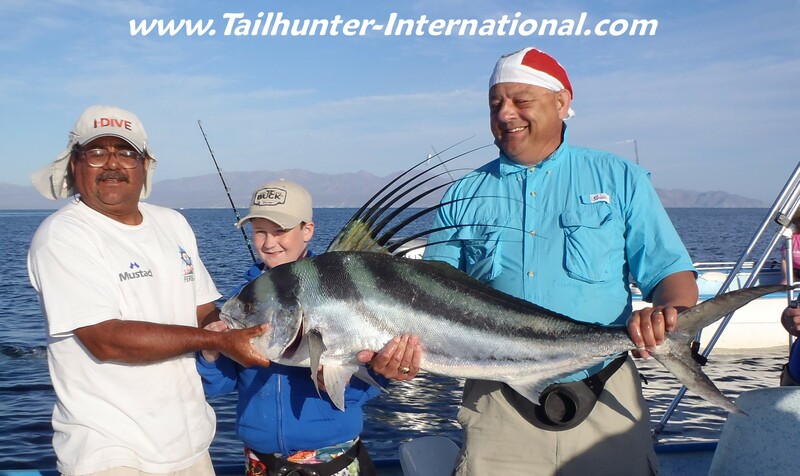 He followed it up the next day with this 40 pound fish taken near Espiritu Santo Island. He couldn't have been happier! All the roosters were released. It was a great week to kick into amberjack...the bigger tastier cousin to yellowtail. Dave Rose made a banzai run driving from Denver CO, to get in on the fishing. 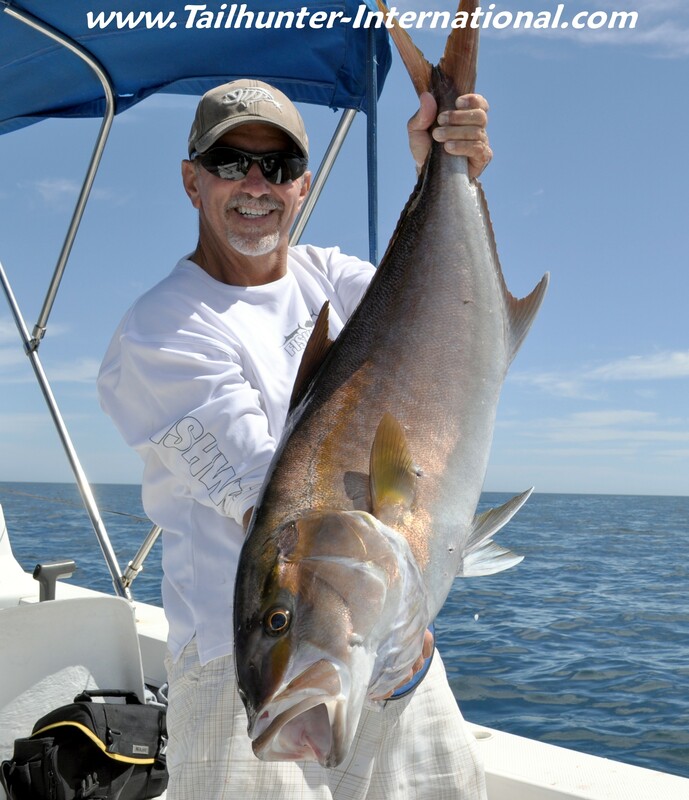 He does this several times a year and was rewarded with this trophy 50-pound class amberjack. Balandra Bay in the background and Captain Chito. 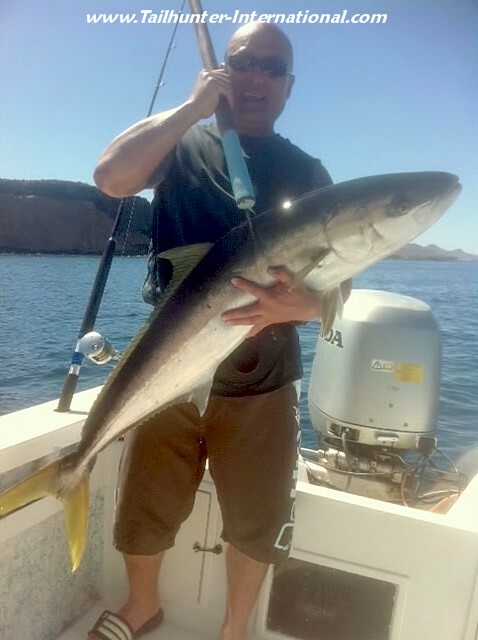 From San Francisco, Wade Ichimura was able to get into that late week bite north of La Paz where he got into some nice yellowtail, pargo and cabrilla on live bait and yo-yo iron.Fishing with our Tailhunter Las Arenas fleet was difficult this week. Scratchy at best as winds, waves and cloudy water made fishing less-than-ideal. However, amigas like our "cookie queen" (she always brings us cookies from Oregon) put some nice jack crevalle and this good amberjack in the box. 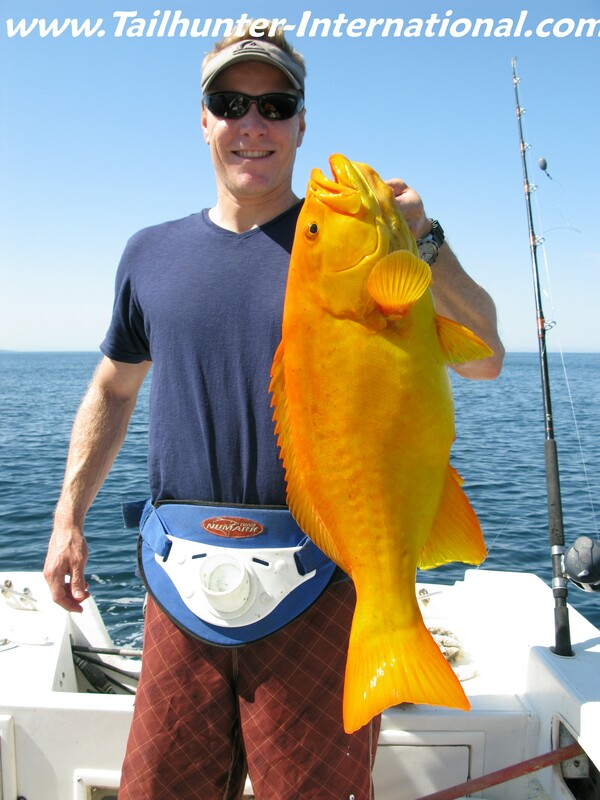 A beautiful Baja Golden Group for Chris Pallemaerts that he took fishing near Espirito Santo Island. In almost 16 years here in La Paz, I've only seen about 1/2 dozen of these beautiful fish taken. Great eating. 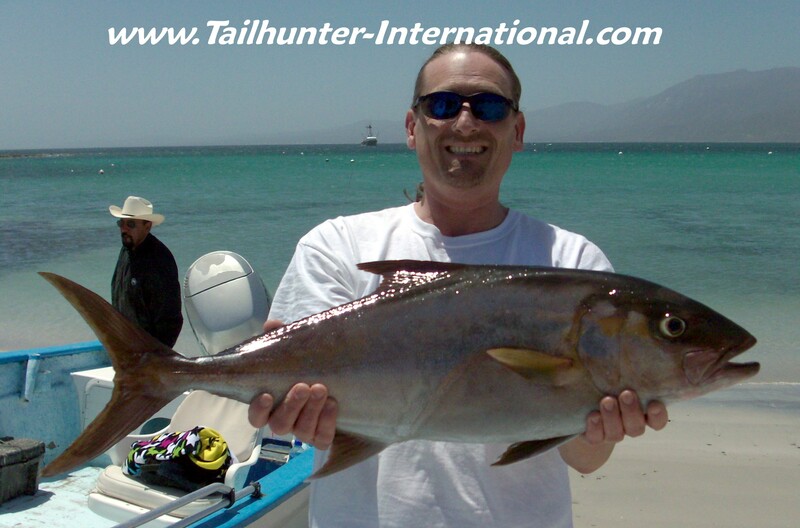 Bill Redalen, all the way from Pittsburgh PA, on his first Baja trip holds up another one of the nice amberjack taken this week. 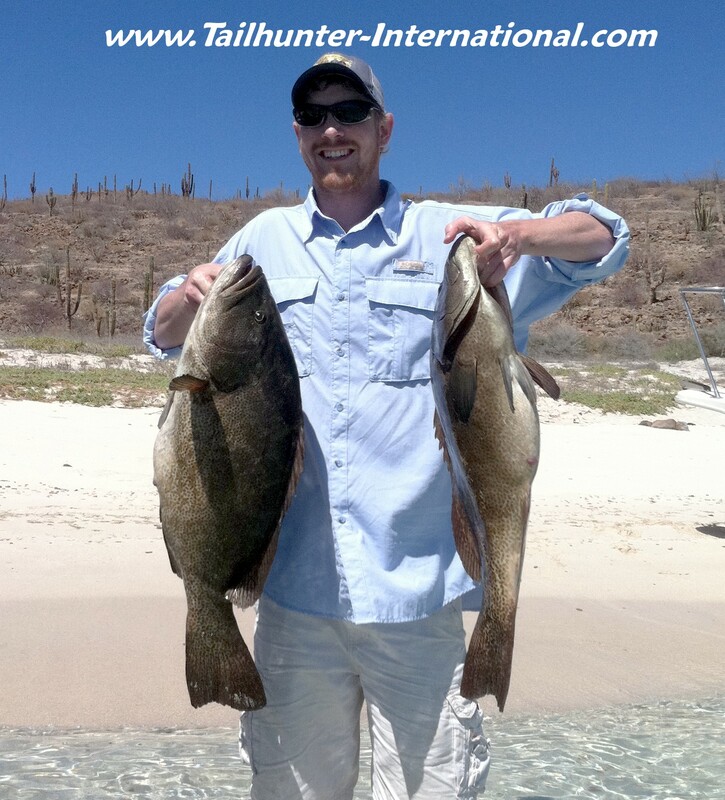 That's Bahia de Los Muertos in the background.We had some colorful fish this week! 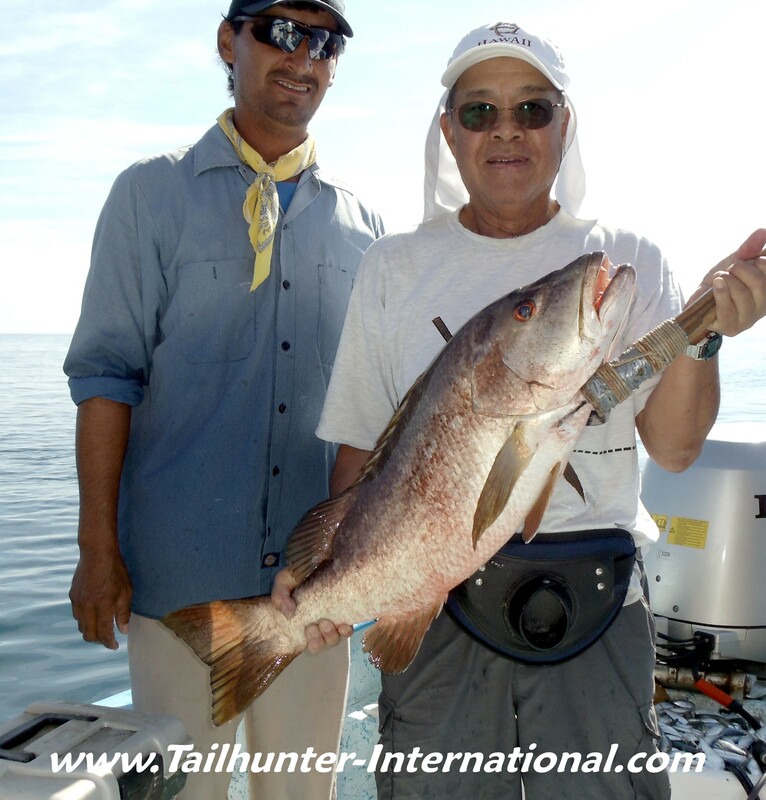 Gilber Jue from the Bay Area poses with a red pargo (huachinango) taken with our Tailhunter La Paz fleet. Great eating rock fish and highly prized by the markets and restaurants in La Paz. We had quite a few "first timers" this week including Richard Jacques from England with a fish he said "is by far the biggest fish I've ever caught" holding up a La Paz yellowtail that was so big, it didn't fit into the picture!He says he has the "Baja Bug" after his first trip here to La Paz, but who can blame Eric Rose, as he holds a freshly gaffed yelllowtail. It's a thick heavy fish! Most of the yellowtail this week were in the 25-40 pound class. 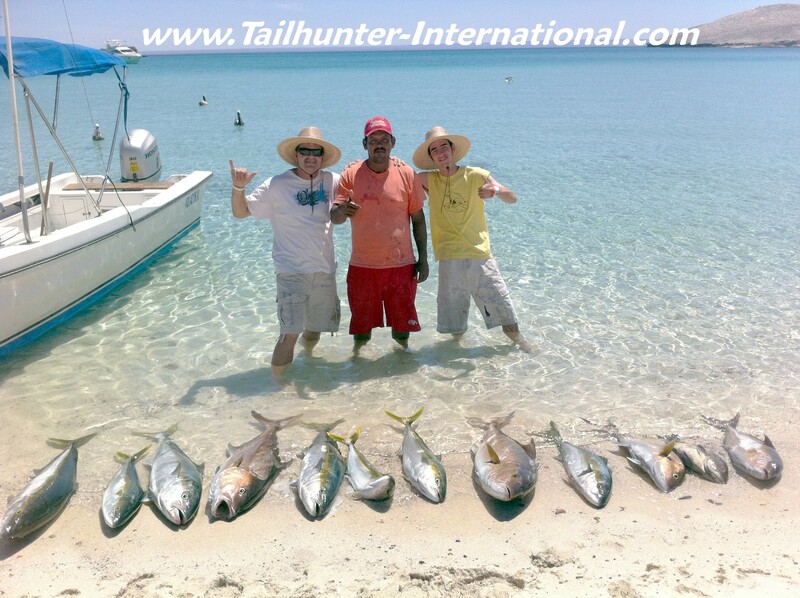 Fishing with our Tailhunter Las Arenas fleet was difficult this week. Scratchy at best as winds, waves and cloudy water made fishing less-than-ideal. However, amigas like our "cookie queen" (she always brings us cookies from Oregon) put some nice jack crevalle and this good amberjack in the box. We had some colorful fish this week! 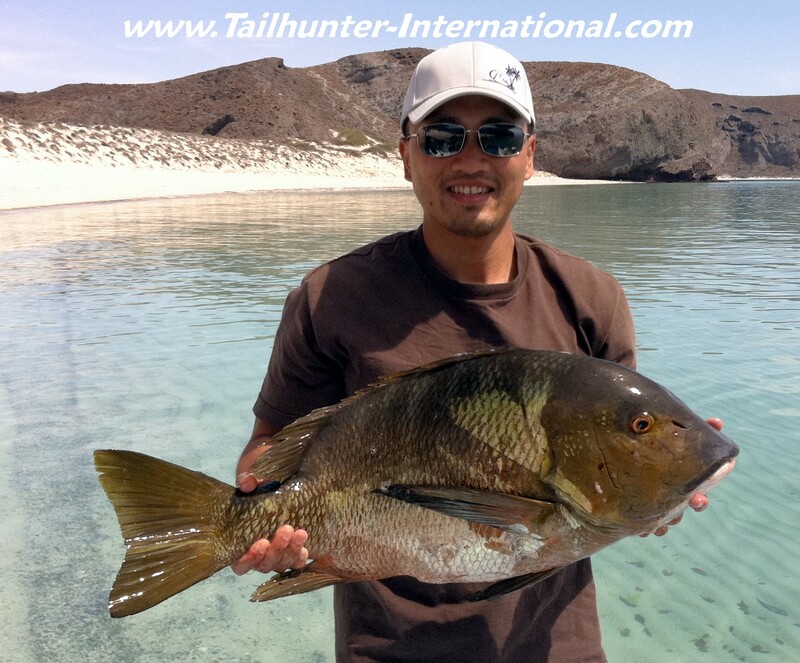 Gilber Jue from the Bay Area poses with a red pargo (huachinango) taken with our Tailhunter La Paz fleet. Great eating rock fish and highly prized by the markets and restaurants in La Paz. He says he has the "Baja Bug" after his first trip here to La Paz, but who can blame Erik Rose, as he holds a freshly gaffed yelllowtail. It's a thick heavy fish! Most of the yellowtail this week were in the 25-40 pound class. The early part of the week was as picky and scratch as could be imagined. I mean…well…it sucked! (for lack of a better word). Winds were strong enough to generate big swells that actually threw waves on the La Paz waterfront and got cars wet and turned the fishing grounds green and dirty. Pretty frustrating fishing. We got some bonito and some small pargo (lost some big pargo) and some really nice roosters …but no one really keeps roosters and smaller fish were getting released. So the counts weren’t very encouraging and coolers looked slack. Not much you could do except shrug and hope for better. Credit to our anglers who hung in there! I mean…honestly…for those of you who have been reading my fishing reports all these years…before Thursday…I HAD ONE PHOTO for the entire week to post in the fishing report! It was THAT SLOW!!! But then Thursday rolled up and winds started calming and waters went flat! We stopped most of our anglers from fishing Las Arenas and switched them over to fish our La Paz fleet instead and WE FOUND FISH!!! 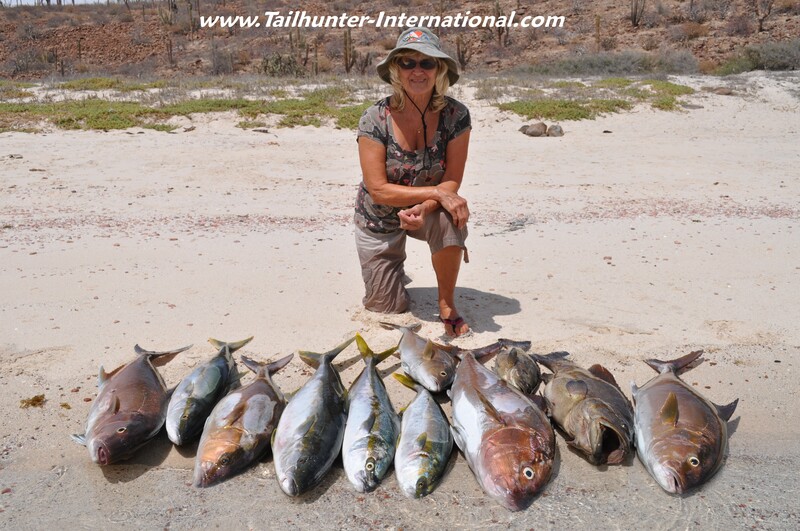 We thought they were gone, but BIG YELLOWTAIL, PARGO and CABRILLA bent rods and came to chew on baits and iron. Big fish lost. Big fish caught. Even some big amberjack too! Empty ice chests started to fill and we started to see the smiles again. For alot of our anglers, spending the last day fishing La Paz meant an 11th hour reprieve after several tough days fishing, meant going home with a successful trip to battle some larger fish! It seems that as long as the winds stay down, we’ll be OK. Very encouraging stuff! Also, more sargasso weeds building so that could be a harbinger for dorado showing up soon! This week looks like it might be a repeat of last week. The forecast shows stronger winds early in the week tapering off as the week goes on. Will keep you posted! Monica Beehn from San Francisco has fished our waters here in La Paz often and usually shows the rest of us how it's done like with this trophy-sized cabrilla she holds up in front of Captain Archangel and eat a live sardine near Bahia de Los Muertos.It would be hard to find a guy who is such an enthusiastic angler as Rich Jones who visits us all the way from Utah. I'm glad he got into the tail-end of our great yellowtail bite we've had the last two months. There are still a few YT around up to about 40 pounds, but they're picky now as the waters warm. Rich got this north of La Paz. It would be hard to find a more enthusiastic angler than Utah fisherman, Rich Jones. He's always on fire for fishing! 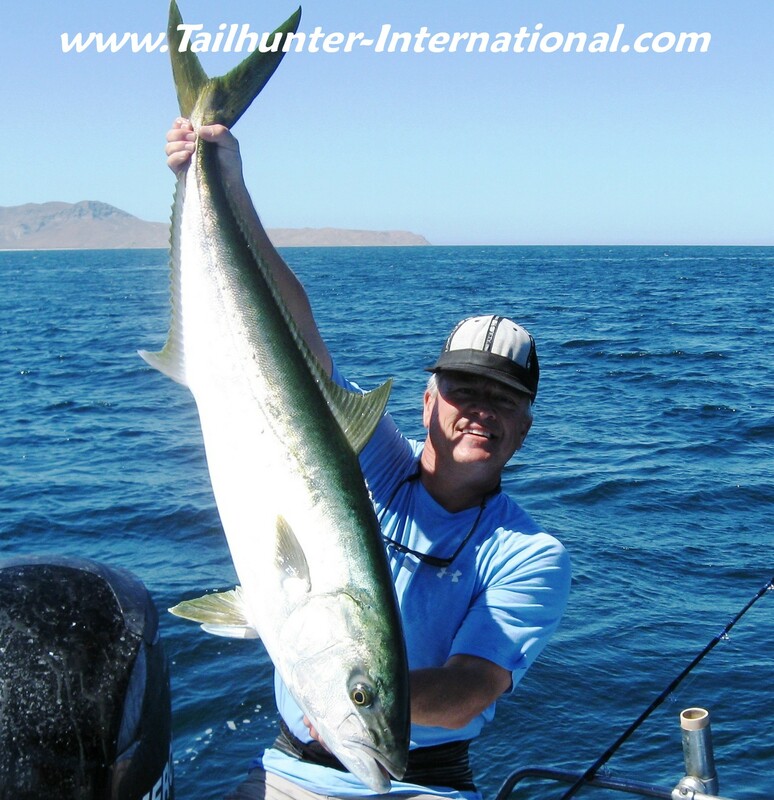 Glad he got into the tail-end of our great yellowtail bite with this nice forktail he got north of town. There's still a few around up to 40 pounds, but as the waters get warmer we're seeing fewer of the big jacks.Big kisses from our amiga, Lisa Cruz, from Washington who outdid so many of the frustrated veteran anglers by nailing this fat pargo liso on her first try fishing with our Tailhunter fleet of Las Arenas.Mitch Chavira is our San Diego amigo who always rips fish down here, but even he admitted it was "scratchy" compared to other trips. 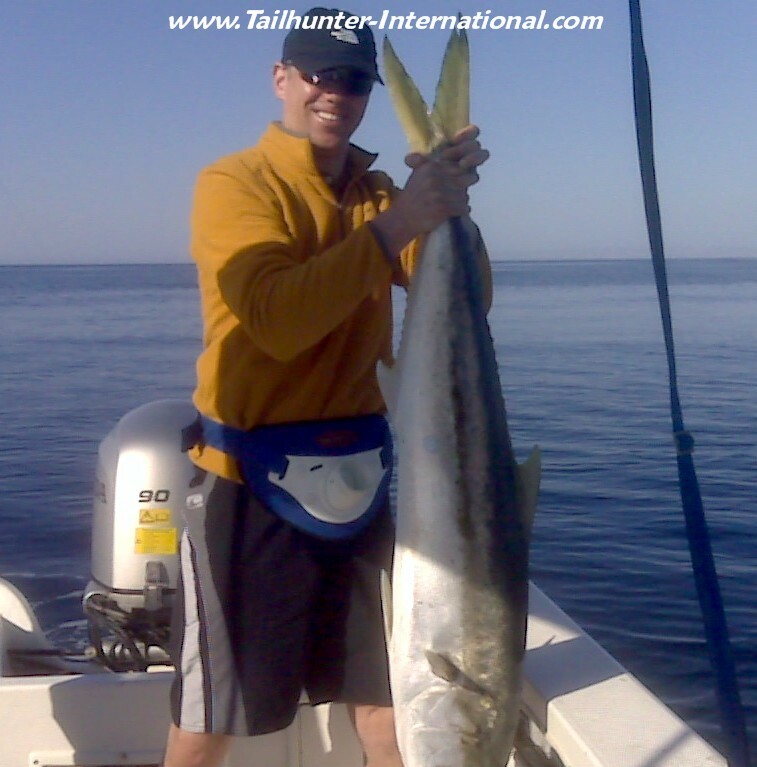 Still, he hung tough and put several nice yellowtail aboard with Captain Juan. Mike and Mike ("Mike Squared") show off a pretty typical catch with our Las Arenas fleet right now...smaller yellowtail (great eating size!) and pargo! 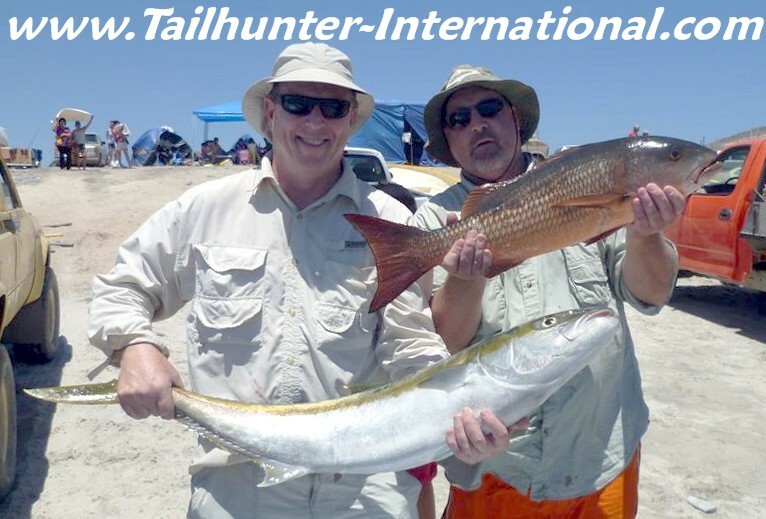 They brought the fillets over to our Tailhunter Restaurant on the malecon for a big cook-up! Our San Diego amigo, Mitch Chavira makes several trips a year here to La Paz with his son, Cole, and has had many an epic trip, but admitted that it was a bit "scratchy" this past week and they had to work hard for their fish but they still managed several nice yellowtail. A MIXED BAG OF FISHING TO FINISH OUT THE MONTH ! 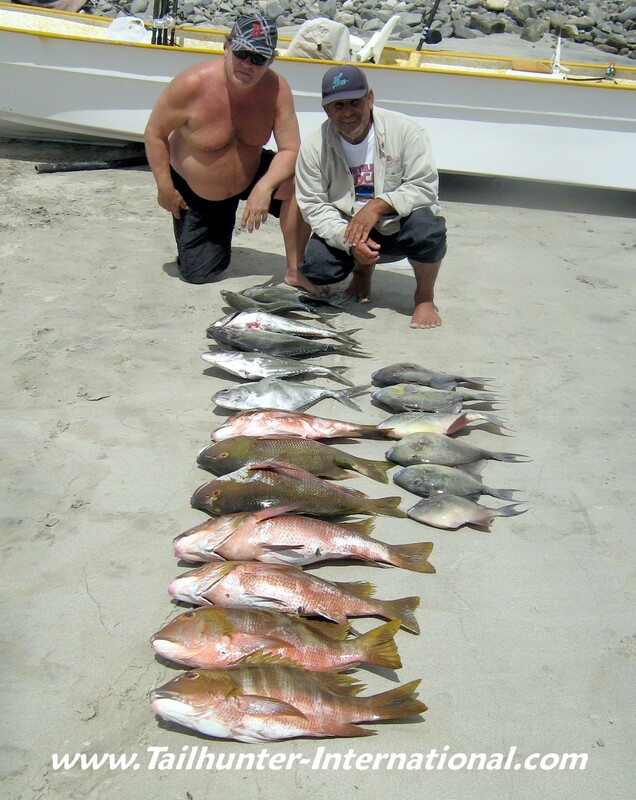 It was an interesting week of fishing in La Paz waters. It surely seems like summer already with air temperatures already in the mid to upper 90’s and water temperatures not far behind. To put it mildly, I think fish are confused…and so are the anglers! No one know what to make of the early season temperature spikes. The cold water fish like the yellowtail seem to have gone to deeper water. The warm water fish like marlin, sailfish and dorado are acting like the curtain came up too early on showtime! They’re not sure if they are quite ready to bite! So, bottom line, we’re getting alot of different varieties of fish. No species in overwhelming numbers and every day seems different. Some days it’s better for roosters. Other days, it’s a pargo day. Another day, it’s a smattering of this and that with each panga coming back with a different story about what they caught. For our Las Arenas fleet, we go into roosterfish up to 40 pounds…pargo up to 24 pounds (with many lost to the rocks)…cabrilla…a few dorado…some sailfish hooked up and quite a few bonito. There’s still some firecracker yellowtail around as well in the 10-12 pound class. Although not good eating, the roosterfish have really been fun this week and a welcome biter when other fish aren’t really going off. For our La Paz fleet, it appears that we’re about done with the fantastic yellowtail bite of March and April. It has been replaced with pargo, roosters (some big boys too!) 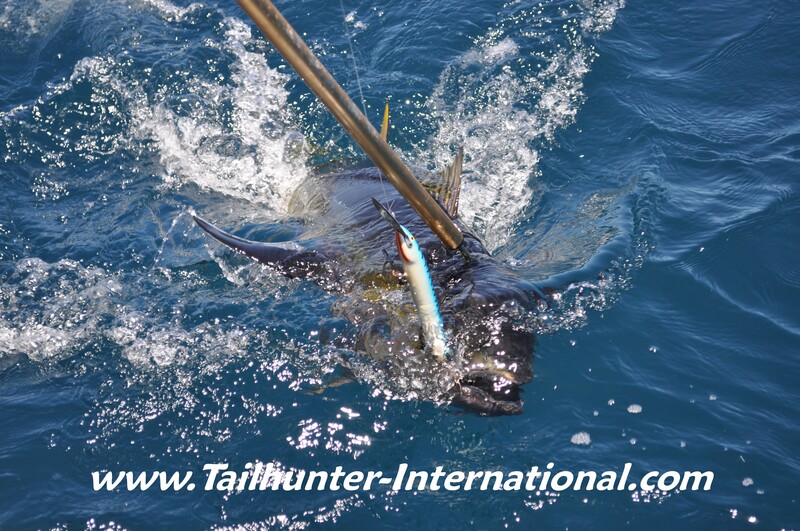 and big cabrilla with lots of marlin and sailfish cruising around and seemingly on the verge of biting. In fact, may be by the time you’re reading this, they will be on a full-blown chew. I’m seeing quite a bit of sargasso weed floating in the channel plus sardines and flying fish in abundance. All the conditions seem like they’re coming together! Just as I’m writing this, I got a report of some wahoo at the south and north end of Cerralvo Island as well as some slugger yellowtail and some tuna that showed up on the north end! Plus squid floating as well with the commercial guys throwing nets on them! Will keep you posted. We’ll go do some recon! On Easter Sunday, we put down the rods for the day and were invited for a day of diving and snorkeling at the sealion colony at Isolotes north of La Paz. I’ve dove with the sealions numerous times over the years and they are always fun. Never the same twice and the young ones are always clowns. It’s a great day activity for a non-fishing day!